As we know, iPod only supports the playback of .mp4, .mov and .m4v video files. However, if you have some DVD, IFO files or ISO files and are wondering how to play them on your iPod touch, iPod classic, etc. Here you can find a good option. What you need to do is to convert DVD or ISO to iPod compatible video formats before transferring the files to iPod. Just read on to see how to put DVD on iPod (iPod Touch 5). Rip DVD audio to iPod supported MP3, M4A, AIFF, etc. This DVD Converter for iPod can help you easily convert and rip DVD to your iPod touch, iPod nano, iPod shuffle, iPod classic, etc. and let your edit your DVD movies to get the very part and effect you want. 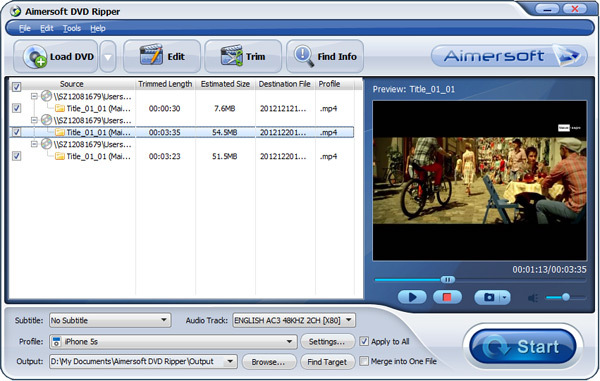 But what makes Aimersoft DVD to iPod converter better than others? Read on to get the answers. With this DVD to iPod Converter, you can easily bypass DVD copy protections and convert DVD video to MP4, MOV, M4V or MP3 for iPod touch 5, iPod shuffle, iPod classic and iPod nano and more. Is the DVD movie too large for your iPod? You can trim the video into small flips by setting split time to fit your iPod. In addition, you can also merge multiple selected titles into a large one file. Want to watch your DVD movie in full screen on your iPod? This DVD to iPod converter allows you to crop the black bar from DVD movie, apply movie effects, add picture/ text watermark to personalize your DVD video, and adjust the professional parameters to optimize your conversion. This program has a quite easy-to-use interface. You can just get all your work done in clicks. 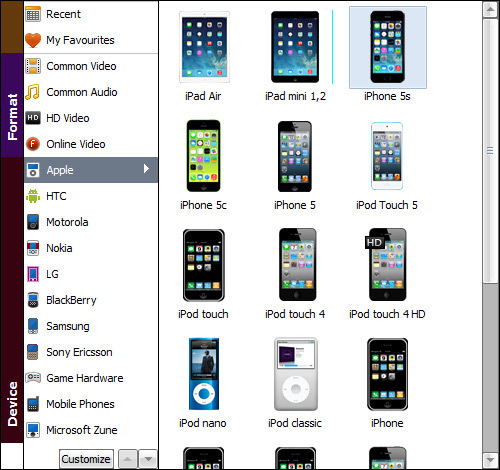 What's more, you can preview the added files, ，take snapshots, choose subtitles, etc. as you like. DVD to iPod converter also supports converting files in batches. 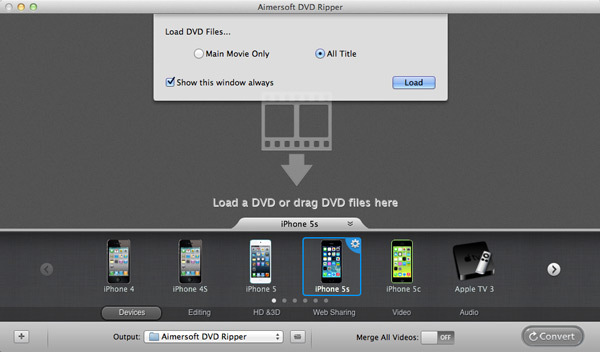 Aimersoft offers two versions of DVD to iPod converter: DVD to iPod converter for Windows (Windows 8) users and DVD to iPod converter for Mac OS X (Mavericks and Mountain Lion included). Below is the step-by-step guidance on how to copy DVD movies to iPod touch 5 or other iPod model. Insert the DVD disc you want to rip into your computer's DVD-ROM and click "Load DVD" to load DVD files. DVD Folder, ISO files and IFO files can also be converted to iPod compatible format. 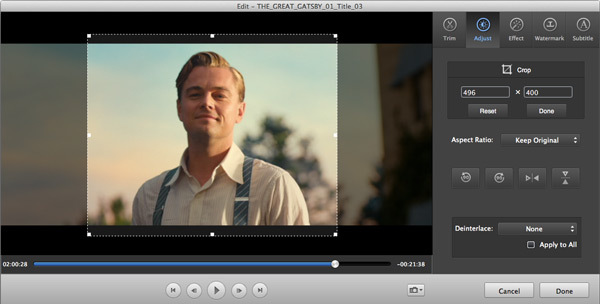 Tips: As you can see, you can preview your DVD movies and take snapshots of your favorite movie scenes. To play DVD movies on iPod, you can simply click the "Profile" drop-down menu and choose "Apple" > "iPod" as the output video format. Video presets for all models of iPod are provided. After all necessary settings, just click the Start button to start ripping DVD to iPod. Within several minutes, the converted videos are ready for your iPod. 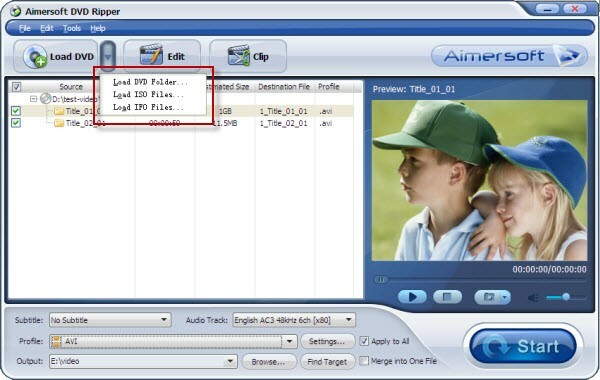 Note:If you have dozens of videos shot by iPod and want to convert iPod videos to DVD for preserving, Aimersoft DVD Creator is the recommended tool. Download and install Aimersoft DVD to iPod Converter for Mac and then follow the quick-start guide below to complete your conversion in just a few mouse clicks! Insert the DVD disc into your Mac and launch the program. Then click File -> Load DVD to add the DVD movies you want to play on your iPod touch. Choose an iPod supported video/audio format. Video presets for all iPod models are provided. You just need to choose the model of your iPod. Besides streaming DVD to iPod, you can also touch up movies in DVD to get a better playing experience on iPod with its built-in movie editor. •	Trim and Crop - Allow you to choose your favorite part of the DVD movie and customize frame size. •	Effect - You can change the movie audio volume, image brightness, saturation, contrast and apply artistic visual effects. • Watermarks - Both image watermarks and text watermarks are allowed to add to your movies to get a personal mark. After all the settings, click the Convert button to start converting your DVD movies to iPod. I use it to merge various video clips into one and the result is good. Thanks!